Olafur Eliasson is a Scandinavian artist, perhaps best known for is works at Tate Modern (The Weather Project, 2003, pictured right) or his New York City Waterfalls of 2008. Eliasson creates ephemeral works that play with feeling and perception, creating all-encompassing atmospheres and scenarios. 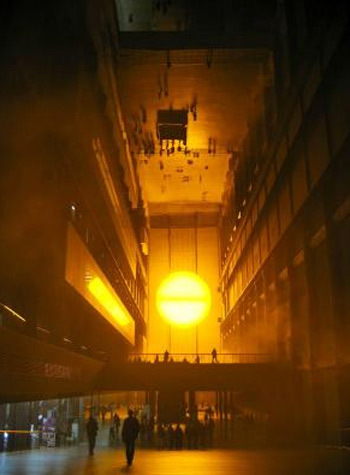 Eliasson has been commissioned to create a central artwork for the London 2012 Olympic Games, however controversy has arisen as the Olympic Lottery Distributer (OLD) has refused the application for funding for the work. The project, for which an application for funding in the amount of £1 million had been submitted, was said to no longer meet the funding criteria of the OLD. The proposed installation, to be called Take A Deep Breath, was to ask people to inhale and exhale on behalf of a preferred person, movement or cause. Each person was to be recorded, and featured on a website in a personal 'breathe bubble'. The total cost of the project is said to be $1.5 million, which would take up a considerable proportion of the $26.1 million that is available for the Cultural Olympiad, which is a major reason for the knock back. It's also said that the project has changed considerably since the idea was first pitched. In a video about the project, Eliasson has said that "There's not a lot to celebrate in the Olympics, and I thought I would make a work of art that expresses some of the weaknesses of the Olympics." At a time when social and economic conditions are on a downturn, the Olympics is being heralded as a reason to retain pride and celebrate, so it's likely that Eliasson's negative opinion on the matter also has something to do with the rejection of his funding application. With less than 100 days to go until the Olympics, the UK doesn't have long to wait to see what sort of artworks do get the green light to celebrate in London this year.